The ability to accumulate and access savings is a fundamental determinant of economic security for many families, especially those with low incomes and limited resources. Since every family's circumstance is different, so too are their savings needs, which can range both in time horizon and flexibility of purpose. Current federal policy favors longer-term, targeted purposes, such as savings for retirement, leaving a void in policy supports for households whose savings needs are more immediate. This impedes a household's ability to build up a stock of flexible use savings that are accessible to buffer against financial shocks or to invest in ways that may improve their future, roles that serve as the underpinning for economic mobility. Policy solutions to fill this gap need to address both the lack of resources that lower-income households can dedicate to saving and the lack of products that facilitate saving for flexible purposes. 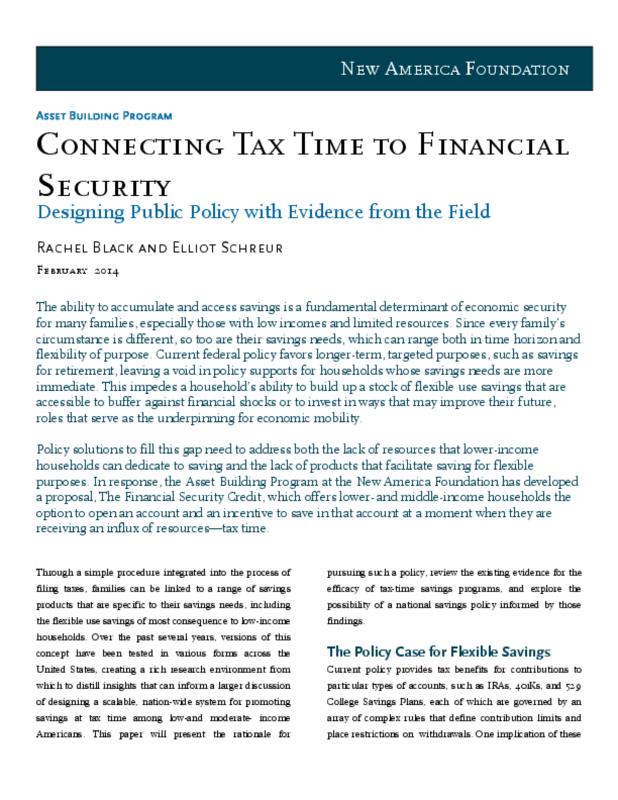 In response, the Asset Building Program at the New America Foundation has developed a proposal, The Financial Security Credit, which offers lower- and middle-income households the option to open an account and an incentive to save in that account at a moment when they are receiving an influx of resources -- tax time.